Director Adam Green will be showing Boston some love for a 3-day fundraising event to help raise money for the Boston Marathon bombing victims from May 28-30. All proceeds from the events will go to The One Fund. Green and fellow cast mates Joe Lynch and Laura Ortiz of FEARnet’s Holliston will make an appearance in Green’s hometown of Holliston, Ma on May 28. The cast will premiere 3 episodes of the show’s upcoming second season and hold a Q&A session at the Holliston High auditorium. Following the screening and questions with the cast, attendees are invited to an afterparty at Casey’s Publications, the local bar depicted as Casey’s Crossing on the show. The best part? It only costs $5 to get in! 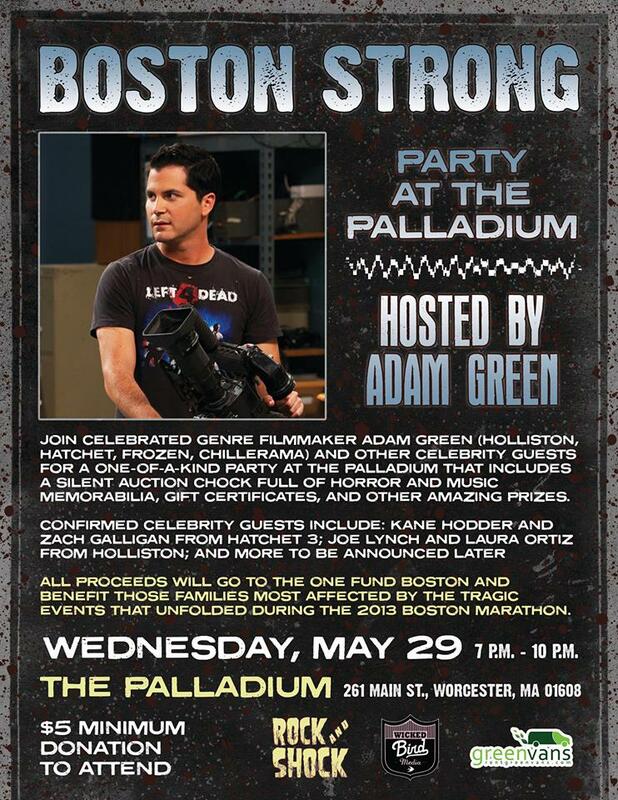 After the Holliston premiere, Green, Lynch, Ortiz, Kane Hodder, Zach Galligan, and more will be holding a Boston Strong Party at the Palladium in Worcester, Ma on May 29. An auction will be held, giving fans an opportunity to buy awesome memorabilia including Gwar’s Oderus Urungus’ real mask. And, for fans who are looking for a little something extra, and a chance to win Green’s heart, you can bid to win a date with him before the party! The event costs a minimum donation of $5. Lastly on May 30, Green and Hodder will host a Hatchet movie marathon and premiere Hatchet 3 at Revere Hotel’s Theater One in Boston. Tickets for the event cost $25 and you can find out more information here. Not only will you get to have some awesome horror-related fun for three days, you will be doing it all for an amazing cause! More information on the events and how you can purchase your tickets can be found here. Lets show Boston how awesome horror fans are by donating now!